I’ve waited a few weeks to blog about this yarn because our first batch disappeared so quickly! I brought some of these self-striping wonders home to photograph and I soon received a call: they would have to come back immediately. Most in demand is the Watermelon colourway, pretty pinks and greens with tiny bits of black: they even thought of the seeds! 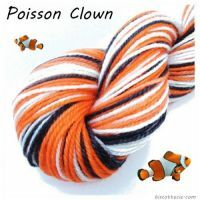 Biscotte and Cie is a Quebec based yarn company with stunning self striping sock yarns in an array of whimsical colour schemes. 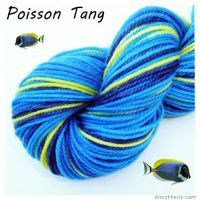 Poison Clown is reminiscent of Finding Nemo (and Poison Tang is a nice compliment along these lines). There is a Cat in the Hat colourway and even a Harry Potter inspired Sorcerer’s Uniform! Each skein makes a pair of socks and we have many free patterns to accompany Biscotte and Cie’s fun yarn. This entry was posted on Tuesday, June 5th, 2012 at 9:17 pm	and is filed under Uncategorized. You can follow any responses to this entry through the RSS 2.0 feed. Both comments and pings are currently closed. Do you carry the Cat in the Hat colourway? Thanks! Sure do! Are you making those adorable gloves? do you have watermelon and poisson nato in stock? 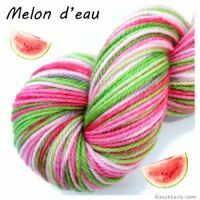 We have all the Biscotte and Cie free patterns that come with the yarn and we do have the Watermelon in stock.